Select-A-Size Easy Dial Programmable Coffeemaker, Silver is rated 3.1 out of 5 by 229. Rated 4 out of 5 by jjbsmom from Great coffee maker This is the nicest coffee maker I have ever had. The programmable feature is great, no more stumbling around in the morning trying to make a pot of coffee. The best feature by far is the size select. I can make myself 2 cups, or I can make a full pot if we have company. Rated 1 out of 5 by PriceChec from A wet mess Have had this coffee maker for 3 months and have been cleaning up ever since. When I open the lid, condensation runs everywhere, every time, so I wipe that. Then when I remove the basket I see liquid underneath so I wipe that, and I see now there's water on the plate so I wipe that too, every time. I turn the coffee maker on, finally, when I think I have all the places dry that are supposed to be dry and wet where they're supposed to be wet. I do love the dial but I think the reservoir could be bigger. Now my coffee is brewing and I can go chill while the coffee is brewing but what... is that... crackling sound?? Somehow more liquid has escaped from idk where and is now between the pot and plate, which was dry! I know it was! I already wiped it. I had to. I have to every time. Now I'm standing in front of my happy place absolutely livid and that's before my hubby and I watch coffee magically land on the floor because the carafe spout design is terrible. That, at least doesn't happen every but if I'm in the least bit of a hurry or if I'm sleepy... smh... but I obviously don't need to go on about that, as it's mentioned in every other comment I've read.I just watched the excellent coffee this disfunctional machine makes jump around my cup and onto the floor for the last time. I'm throwing this thing out. I usually spend $20 on a coffee maker but the select a size and the water tank sold me so I spent more than twice that when I purchased this. It would have been a steal at $45 if it hadn't cost me all the annoyance. Seriously, did anyone test this machine before they were put on shelves? Rated 1 out of 5 by Flippo Street Resident from very disappointed So a coffee maker is a coffee maker. The coffee brewing is not the issue here. But the carafe has a flaw in it's design. So pouring a cup of coffee from the carafe is such an exacting and tedious action, so that none is spilled, that's it almost laughable. I have the feeling no one product tested this before manufacturing and selling it. So frustrating. I will throw it in the trash today. After this experience, I would not purchase any Black/Decker appliances. Rated 1 out of 5 by JustKaren from "No drip" carafe is NOT "no drip" The flat design of the carafe pour spout makes too much coffee pour out and most times onto my counter. We've had to place paper towels next to the coffee maker to clean up the mess. I would like to get another carafe with the pointed spout that is actually drip proof to replace this one. 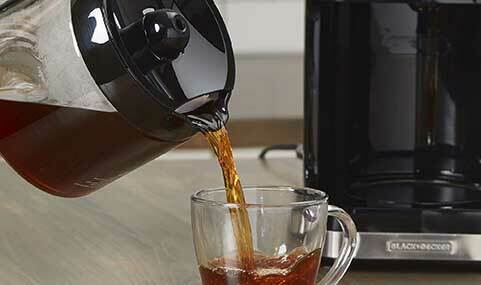 Rated 4 out of 5 by Dena from Love this Coffeemaker! In the store, I was sold on the idea of 80oz reservoir and select-a-size quantity. I did the math in my head (incorrectly) in the store and thought I'd get more pots of coffee from it and was disappointed to learn later that 80oz = 14 cups. You can thank their marketing team for that little gem. So, if you brew 12 cup pots every day, you'll need to fill it every day. In our house, the early-bird makes 4 cups and the sleepy-head does 8, so it works well for us. We use this pot every day, twice each morning and it has always brewed the correct amount requested. I wish it had an indicator beep when it's done because it brews so quietly.I too had trouble with the pot leaking/dripping/making a mess. But, I learned how to pour it and no more messes. You have to pour the liquid precisely in the center of the spout, holding the handle perpendicular to the ground. If you loosen your hand a bit and let the pot center itself and pour slowly you won't have any problems. I do like the wide spout, but the side lips are short therefore the coffee will spill over if you don't pour it straight. I made a mess the first two times I used it, but quickly caught on and haven't had an issue since. AND I love how strong and sturdy the pot feels. I'm a clutz, we always have a spare pot in the house because we never know when I'm going to break one. This pot feels very rugged in my hand and so far I haven't broken it.My only gripes are that you can't turn on the warming plate on its own. We have several items in this one area that use a single outlet. In the mornings, sometimes I need to unplug the coffeemaker to use another appliance (toaster) and would like to plug it back in and use the warming plate.Secondly, the condensation that develops inside the brew basket area is extremely messy. 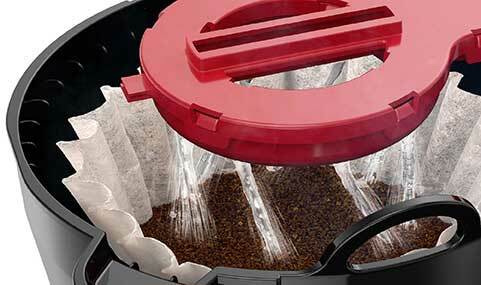 When opening the lid, all the water pours between the brew basket and its housing and then into the coffee pot OR onto the warming plate if the pot's not there. And there's always a surprising amount of liquid left in the brew basket when I dump the used filter, be careful that you don't make a mess. Honestly, these two issues are minor for us and we are glad we made this purchase. Rated 3 out of 5 by TLBABY from Basket Assembly The coffee maker has worked OK, except for the water vs brew amount. It's only a few months old and is only use it a few times per month. The spring and cap on the bottom of the basket fell off. Not sure if it snaps on or how to reassemble it. Where can I find a replacement Carafe for this model? Thank you for your question, and thank you as well for working with us on a solution. I'm happy to advise that your replacement is preparing to ship via UPS. If you need any further assistance with your coffee maker, please reply to the email I've sent you from youropinionmatters@spectrumbrands.com, so I can address any of your concerns. Just bought mine and the temperature does not stay hot or even warm enough to drink. I programmed my maker to &quot;brew later&quot; and within 1 hour after perking, the coffee was luke warm. Per the manual it should stay hot for two hours. Answering my own question. 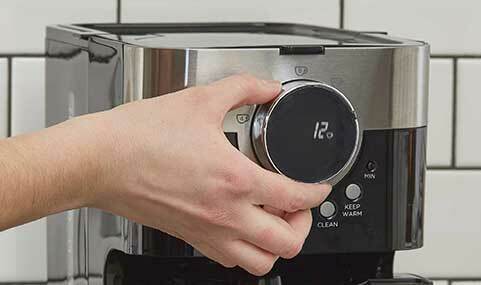 The &quot;Keep Warm&quot; button is for setting the stay-warm-time after the brew. Once it goes off however, there is no way to add additional time once the coffee has cooled. 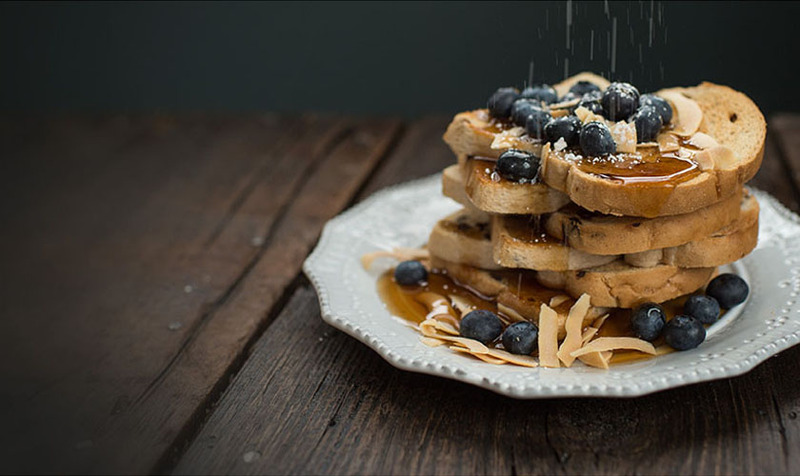 I wish there was a way to re-heat or extend the warming after that without having to waste more coffee by throwing out the cool/cold and starting all over. We have been very pleased with this coffee maker. Recently the digital display has become so dim that it can't be seen unless the kitchen lights are turned off. How can I brighten the digital display to its original appearance? Is it possible to reheat coffee after it shuts off without rebrewing? 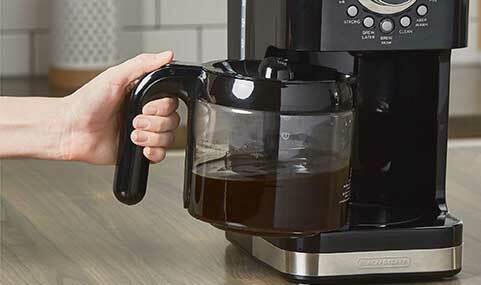 How can I order a replacement 12 cup glass carafe w/lid part#CM4200-02 for Select-a-size easy dial programmable coffeemaker(model #CM4200S). Have been unable a to locate a replacement carafe on-line. How can I get the digital display to brighten? It used to be fine, but not it's so dim we have to turn the kitchen lights off to read it.